I first got put on to K’naan through Myspace a couple of years ago and later through DJ Edu’s show on BBC 1XTRA. 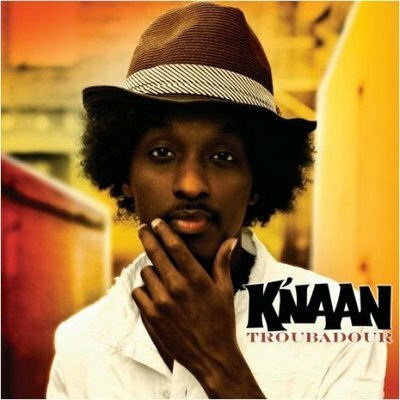 Born in Mogadishu, Somalia and currently residing in Toronto, K’naan drops his second full length effort Troubador, following his well accepted international debut Dusty Foot Philosopher. During his first release, he would soon go on tour with the Marley brothers Stephen and Damian, and would later spend four months at the late Bob Marley’s house and recording studios to put together this release, with Stephen as a “spiritual producer” of the album. Guests include Mos Def, Chubb Rock, Chali 2na (Jurassic 5), Metallica guitarist Kirk Hammett, Damian Marley and an L.A. children’s choir. I first have to speak for a minute on the country of Somalia..After doing some research, it seems that K’naan has alot to speak on in regards to his homeland. I’m talking about REAL pirates in the oceans. Story says (if you may not have heard) that European firms began dumping toxic waste around the shores of Somalia, so they took matters into their own hands by hijacking anyone who comes near their waters, while holding them for a huge ransom.Couple that with a collapsed government and youth running around with guns and you have a few of the realities of Somalia. Ok, back to the music..This album definitely has the proverbial “something for everyone” in terms of styles that weave in and out of hip hop, rock, pop, traditional Ethio/Somali music, and folk, but what I like most about this album is that K’naan manages to reflect, be totally honest, and straightforward about life, love, and struggle (in a believable way) while still having fun, attributes all needed in today’s music. Much props to the brother for pulling off a multi-genre album that doesn’t come off as overproduced, watered down or just plain corny. Pick this one up through the links on his myspace page, and check out the videos and singles as well. Junior Star gives Troubador a 6.5 out of 7 head nods. T.I.A. – Straight up party starter, call and response, great opening track. ABCs – (feat. Chubb Rock) – K’naan+Treat Em Right sample+ Chubb Rock=Classic. Bang Bang (feat. Adam Levine) – Reminds me of when I used to rock out to Duran Duran back in the day, pre-hip hop era..
15 Minutes Away – Funny track about receiveing and sending money via Western Union..brings back old college memories..
Fire In Freetown – 2nd favorite Track. Dope song all singing and no raps. I have to give a SUPER shout out to my son who requests (and absolutely wilds out to) this album and videos everyday.